Ken eventually left the Gardiner Library to put his energy into growing — literally — what became the Hudson Valley Seed Library, which began business in 2008. What about the borrowing and returning? Seed-growing takes a certain amount of know-how. To maintain trueness (that is, a seed from a packet labeled Buttercrunch lettuce snuggled into the ground actually grows into a Buttercrunch lettuce plant), Ken started growing most of the seeds for sale himself. importantly — they get an education on how to best grow the plants, maintain trueness, and collect the seeds for the year’s variety. So a promiscuous vegetable, such as cucumber, whose female flowers mate easily and readily with any cucumber pollen, needs different treatment than, say, a tomato, whose flowers maintain greater fidelity because each one has both male and female parts, and just a little vibration — a breeze, perhaps — unites male with female parts. This year, community growers harvested Blue Pod Capucijners Soup Pea seeds. Dwarf Sunflowers are on the docket for next year. vegetables or flowers, but of an artist’s representation of the particular variety. 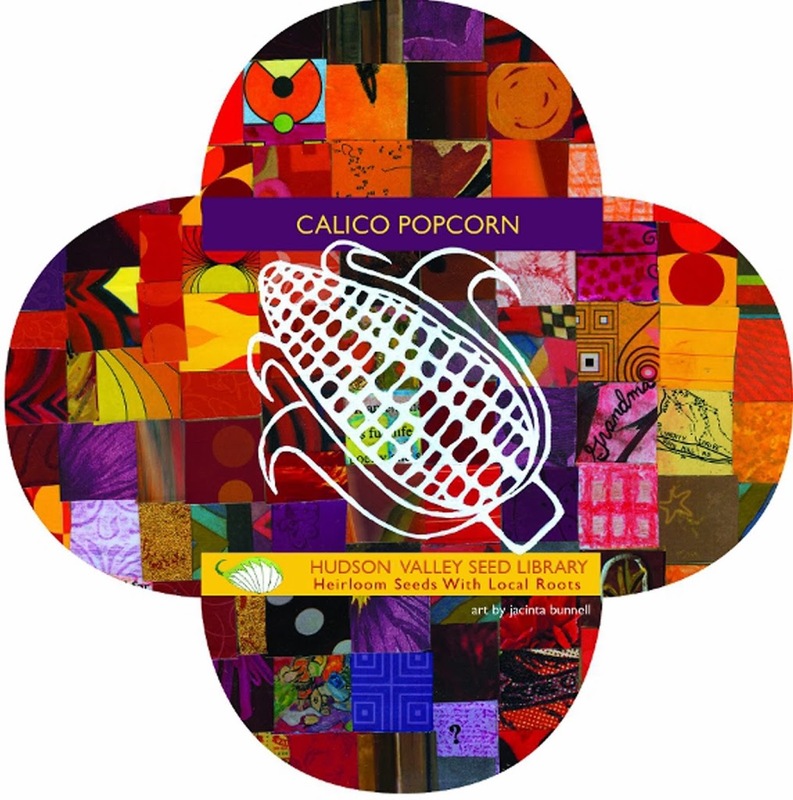 So Calico Popcorn’s packet, illustrated by Jacinta Bunnell, sports a line drawing of an ear of popcorn against a colorful calico backdrop. 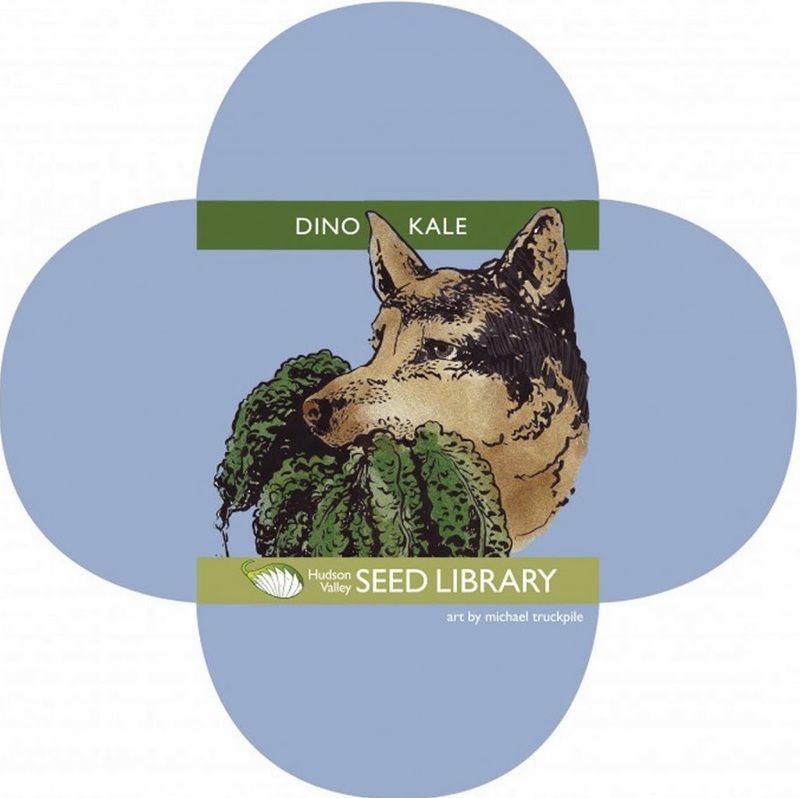 A German Shepherd — Ken’s old dog, Kale — with a mouthful of kale decorates the packet of Dino kale illustrated by Michael Truckpile. As I sit here writing, yeast and Lactobacilli bacteria are having a field day, feasting on moistened wheat flour that’s expanding by the minute as carbon dioxide is generated and trapped in dough. My bread is rising, bread made from seeds I saved for eating — wheat — grown this summer. I finally tired of looking at the red pillowcase of wheat seedheads that had been sitting on the floor in a corner of my kitchen since the end of July. Whacking the pillowcase was supposed to knock the wheat berries off the stalks; it didn’t, not sufficiently, at least. A reader suggested pounding the pillowcase with a shoe. I did it, and — voilà — one cup of wheat berries from a 15 square foot planting. I ground the wheat into a flour in a coffee grinder. I had wondered how much land would be needed to grow a loaf of bread and now I know: 45 square feet, at least for me, a beginner in grain growing. Average wheat yields in this country are about 40 bushels per acre, which translates to twice my yield, in which case a loaf could be squeezed out of about 23 square feet. However, wheat yields can run as high as 150 bushels per acre — something to strive for (a loaf from 6 square feet). This entry was posted in Uncategorized and tagged bread, Hudson Valley Seed Library, Ken Greene, wheat. Bookmark the permalink. Trackbacks are closed, but you can post a comment.